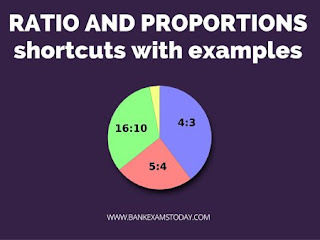 Must read Ratio and Proportions shortcuts here. If a: b = 5 : 9 and b : c = 4 : 7, find a : b : c and a : c.
If x : y = 3 : 4, find (4x + 5y) : (5x – 2y). Divide Rs. 1162 among A, B, and C in the ratio 35 : 28 : 20. Solution: Sum of the terms of the ratio = (35 + 28 + 20) = 83. A’s share = Rs. (1162 × 35/83) = Rs. 490. B’s share = Rs. (1162 × 28/83) = Rs. 392. C’s share = [1162 – (490 + 392)] = Rs. 280. 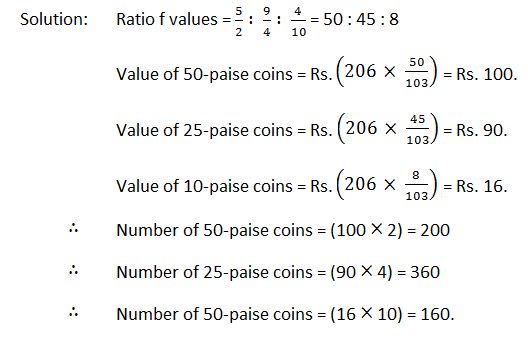 A bag contains 50 paise, 25 paise and 10 paise coins in the ratio 5 : 9 : 4, amounting to Rs. 206. Find the number of coins of each type. Which one of 2 : 3, 4 : 5, 7 : 9 and 11 : 13 is the largest ratio? Clearly, 0.846 > 0.8 > 0.777 > 0.666. Hence, 11 : 13 is the largest ratio. A mixture contains alcohol and water in the ratio 4 : 3. If 5 litres of water is added to the mixture, the ratio becomes 4 : 5. Find the quantity of alcohol in the given mixture. Suppose x varies as the sum of two quantities of which one varies directly as x and the other inversely as x. If y = 6 when x = 4 and y = 3 1/3, when x = 3. 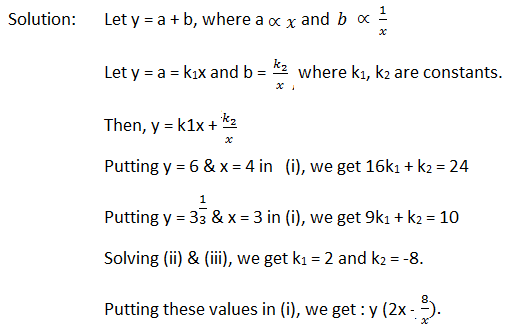 Find the relation between x and y.